I know something you don’t know. I think. Maybe. Unless you’re my boss, and then you already know. But that only accounts for one of you. The rest of you are in the dark. I’ve got a secret. A cool one. And I can’t tell you. Maybe tomorrow, or next week. Soon. Very soon. It’s killing me. I want to blab. Since I can’t yet, I’ll share some pictures instead. Many of our animals at the zoo are maintained in breeding colonies. Most of them produce eggs in their season. We have a big incubator to house all the eggs. There’s a reason, though, that we don’t count our tortoises before they hatch. Sometimes, for whatever reason, they don’t hatch at all. Sometimes embryos don’t ever complete their development, or they never actually develop at all. Sometimes they weren’t fertile to begin with. Things go wrong, and it’s just a part of the job. And sometimes we get surprises. We were surprised this week. There was this egg, see. And candling… Remember candling? 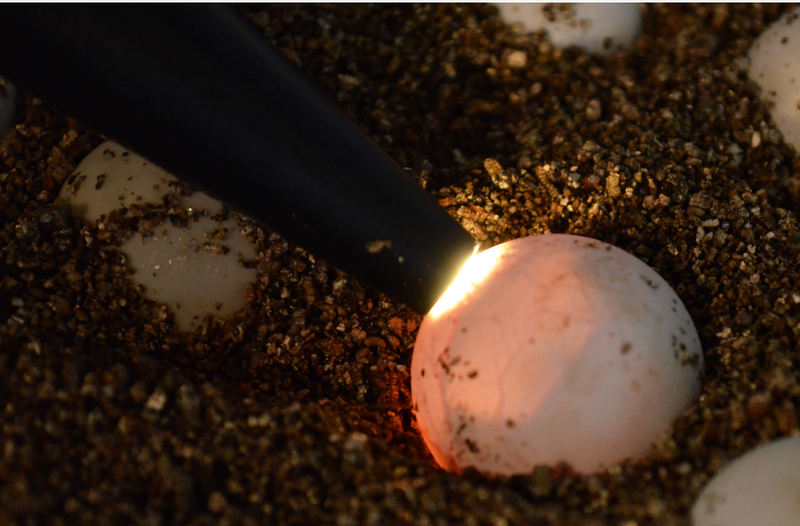 Candling a snapping turtle egg. Note that it is vascularized. The shadow on the right is the developing embryo. See the little nose peeping out? 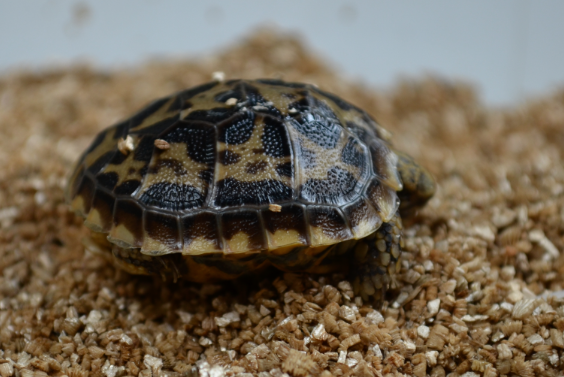 It’s a pancake tortoise (Malacochersus tornieri)! So cute and flat! The next morning, I checked his progress, and he was still hiding out in that egg, probably absorbing his yolk before he made his way into the world. Later in the afternoon, I noticed he was on his way out! These images are best viewed as a slideshow. Click on the first one to enlarge, and then click the right arrow that appears to see them in order. He made several false starts. Then he rested for a bit before taking another go. It takes all his effort to propel himself forward a fraction of an inch. “Imma hatch out of this egg, or Imma eat it.” He did both. Never seen one eat its shell while hatching. Look at the lumps and bumps on the bottom of his shell (plastron). It looks like it needs ironing! He summons his energy and gropes for leverage with his right foot. I got really excited at this point. 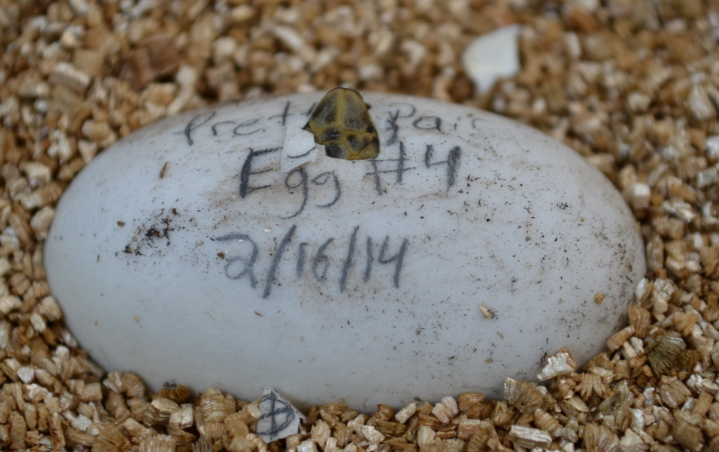 I knew I was going to watch my first tortoise emerge from its egg. Look at that yolk on his belly! The biggest one I’ve ever seen. It will feed him for days yet. The arch of the carapace is impressive. Is he auditioning to be one half of a golden arch? This critter will be flat later on, but it was rolled up in its shell like a burrito. Resting at last. He made it. He stayed in this position for hours. So you want to see something crazy? Of course you do! On hatching day, he looks a little suspect. Look at that bulgy belly! The next morning, belly is flat! Nope! All resemblance to pill bugs was your imagination! In case you didn’t get to read all the captions, this is the first tortoise I have ever seen emerge from its egg entirely. I’ve caught dozens in various stages of hatching, but never like this. Amazing. I love my job! You can keep your secret a little longer, this was more than enough to keep us happy! What fun. You need an apprentice or something right? Great pics. Have never seen a turtle come from the egg, snakes, but not turtles. That is way cool. You have a great job. That was very very fun. I didn’t see the resemblance, but then I am not there with you. Good thing you held onto this egg or this poor little guy (cutie) would have never had a chance! My daughter just finished her freshman year of college—on her way to becoming a zookeeper. We both just “geek out” (her words) about things such as this. So glad you’re living your dream!! Tell her to snag every internship that comes her way. That’s what makes the difference in employment. Zoos want to know potential keepers have more than theoretical knowledge and are willing to get their hands dirty. Best wishes to her in her career goal. I can’t think of anything more enjoyable! Thanks for the advice!! She’s volunteering at our little zoo here in Austin this summer. Little to no hands on animals, but lots of dishes and laundry and food prep. We bought boots today because she got to clean up baby bear poop with one of the keepers and was just in tennis shoes. She’s in heaven! Volunteering is fantastic, as well! That’s how I got my job. It’s the hands-on, right-there-in-the-trenches stuff an employer will be looking for. Because so much of the job isn’t glamorous. It’s washing the dishes and laundry, prepping the diet, scooping the poop, doing endless spreadsheets and paperwork. All so important, but some folks don’t realize that zookeeping isn’t about petting the big kitties. Your daughter is getting off on the right foot! Great pics! I bred rat snakes a long time ago, just for the experience, and somewhere I’ve got an old-school photo of them hatching. It’s just one of the coolest things ever to see those little suckers pipping in person. Wow very very cool and you have all the pictures.